At the start of 2017 everyone–including me–was buying into the bullish story for these companies based on the industry trend of sand, sand and more sand. Sand has been the #1 efficiency driver for the North American oil and gas industry. The average share price decline for this group of companies over a period of just 3 months is 49 percent. What exactly was it about first quarter numbers that the market hated so much? When looking for answers I always do the same thing. Head on over to the SEC website and drill into the some 10Qs and 10Ks. People tell stories, the numbers tell the story. The average share price of the big four frac sand companies has been cut in half since February, so how disappointing are the Q1 numbers from 2017 compared to Q1 2016? All of the companies sold a lot more sand this year. The range of increases was 29 percent at the low end to 185% at the high end. Clearly demand has increased quite dramatically year on year. But what about pricing? Perhaps volumes increased but there was not a similar increase in revenues? Again big percentage jumps year on year. Without knowing that the share prices of these companies have collapsed, you would never have expected it to have happened from just looking at the growth in revenue. Demand for sand is growing and it is growing very fast. The sales volumes of these companies reflect that and so do their revenues. Oil and gas producers confirm it too. They just keep using more and more proppant and keep getting better results because of it. More sand has meant higher initial production rates, lower declines and improved economics. Well, I’ll tell you. This is a case of investors buying the bullish case for sand hook, line and sinker…..and then deciding to drill into the numbers. A great future doesn’t appear in just one quarter. All of these companies have had significant EBITDA improvements in the first quarter of 2017. But if you look at the actual numbers you will likely notice something. These companies aren’t making much money. Two of them have EBITDA that is barely positive and the other two aren’t huge numbers either, especially relative to their market valuations. This is where euphoria meets fact…….and fact tempers euphoria. The long term case for frac sand demand is an extremely compelling one. 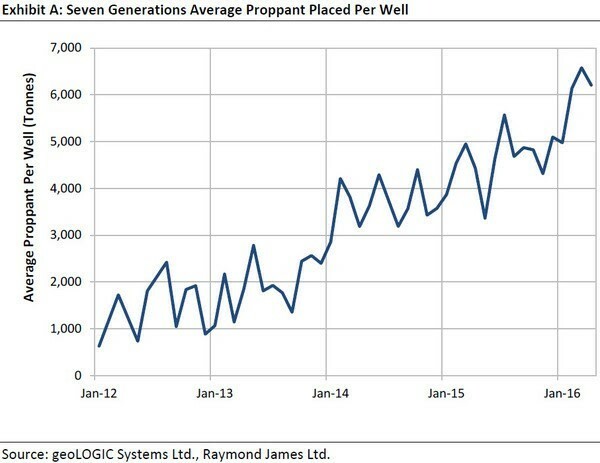 Investors can see rig counts increasing and proppant loads per well increasing even more. Throw in the thoughts of a bit of an oil price increase and it isn’t hard to get very excited. When investors get excited they bid up prices. That is what happened to the frac sand suppliers through February of this year. Excitement resulted in the valuations of these companies factoring in a lot of future growth that has yet to happen. The table below shows the enterprise value of these four companies relative to their Q1 EBITDA levels annualized. Those are some pretty large multiples of EBITDA and remember, this is after these companies have had their share prices whacked in half. Before the selloff the valuations of these companies were really optimistic. Reality Check Yes – But Has The Long Term Really Changed? When these stocks peaked earlier this year there was a huge amount of growth baked into their share prices –a massive amount of growth. The Big Change came when the quarterlies of these Big 4 sand producers were issued. They all talked to sand fundamentals being strong, but their quarterly cash flow didn’t meet expectations. Missing estimates forced the market to do a reality check, and concerns over surprisingly fast increases in new sand supply added to the concern. This is what happens when huge growth expectations get factored in and multiples on the stocks in a sector get really big. It doesn’t take much doubt to cause a big share price reaction. The reality is though that long term growth story for these sector likely hasn’t changed much. The trend to use MORE sand is STILL continuing, so I’m a bit surprised these stocks have been hit so hard. These increases in sand are indicative of pretty much every play in North America…and it is paying off in higher IP rates and lower declines. Going forward, The Big Money in the oil patch isn’t going to be spent in the deepwater, it isn’t going to be spent in the oil sands. It is going to be going to be spent drilling and fracing onshore horizontal wells. The future here is still bright. Figuring out the right price to pay for the growth that is coming is the tricky part.